Choose a toothbrush that is soft and the right size for you. Use suitable tools and proper brushing techniques to clean your teeth without damaging them. Why and how should you brush your teeth? When should you start brushing baby’s teeth? Brushing the teeth mechanically removes bacteria that quickly accumulate on the surfaces of teeth and cause oral diseases. In early stages, bacteria may cause tooth decay (caries) and inflammation of the gums (gingivitis). Tooth surfaces normally have a film made from salivary proteins (pellicle). Bacteria can attach to this film. Streptococcus and Actinomyces bacteria are the first bacteria to attach to the tooth surface. In turn, these bacteria provide places for other bacterial species to attach. When different bacterial species attach to the tooth surfaces, a white sticky mass called bacterial coating (biofilm) accumulates along the gum line. One milligram of bacterial coating contains about one hundred million bacterial cells. The more sugar your diet contains, the faster the bacterial coating will form on your teeth. The more the bacterial species attach to the tooth surfaces, the more serious illnesses they can cause. Brushing teeth is optimized by using fluoride toothpaste. Its effectiveness is based on the use of abrasive or enzyme-based components, and fluoride strengthens the tooth enamel when it is used regularly. In addition, a balanced and healthy diet, together with the use of xylitol prevents most oral diseases, such as caries and gingivitis. Xylitol is a natural low-calorie sweetener that can be used as a sugar substitute. Injuries that may be caused by brushing include damage to the gums (soft tissue damage) or teeth (hard tissue damage). These injuries are caused by improper brushing technique, an overly hard toothbrush, or both. Ulcers on the gums may be the first sign of using a brush that is too hard or applying too much force while brushing. Gums and teeth may be sore. Injuries caused by brushing can lead to gum recession and tooth erosion. They may be repaired with dental fillings. Over time, the gum may recede and the neck of the tooth can be injured. The injured part can be repaired using filling. 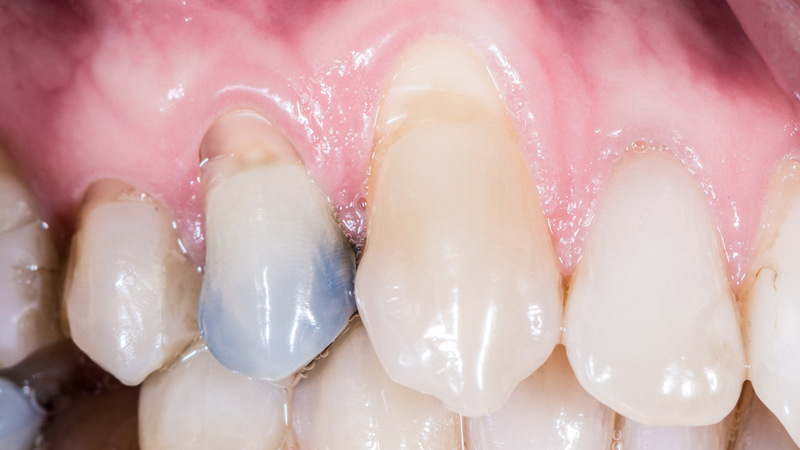 Gum recession and injuries caused by brushing are irreversible changes. Therefore, it is very important to choose your toothbrush carefully and pay attention to your brushing technique. Hold the toothbrush with a pencil grip, not with a fist grip. It is difficult to apply too much force with a pencil grip. Choose a problematic area, such as the inner surfaces of lower teeth, as a starting point. It is difficult to brush them too strongly and you will start brushing using the correct amount of pressure from the beginning. Use an electric toothbrush that notifies you by stopping or using an indicating sound or light if you brush too hard. Brush your teeth with fluoride toothpaste for 2–3 minutes in the morning before breakfast and in the evening before going to bed. A built-in timer, an external monitor or a smartphone app can help you reach the correct brushing time. If your toothbrush does not have a timer, you can note the time on a clock. Complement brushing with flossing and cleaning the tongue to have a perfectly clean mouth and fresh breath. Brush your teeth systematically to ensure that all surfaces are cleaned. Apply a pea-sized amount of fluoride toothpaste on the brush. Hold your manual toothbrush gently using your thumb, index and middle fingers. Use the whole hand if you use an electric toothbrush, but do not squeeze the toothbrush. Place the manual toothbrush diagonally against the tooth surface and move the brush systematically forward using small, circular movements to clean all surfaces. Using an electric toothbrush is different than brushing with a manual brush. You should not move the brush head back and forth like a manual toothbrush. Tilt the brush upright when cleaning the inner surfaces of upper and lower front teeth to facilitate thorough. If necessary, finish brushing problematic areas using a special toothbrush, such as a solo brush. Finally, spit out saliva-toothpaste mixture without rinsing the mouth. The small amount of fluoride left in your mouth strengthens the tooth enamel. Rinse the brush and leave it out to dry with the head up. Pay attention when cleaning the gum line, especially if the tooth is in a narrow place or has erupted only partly. 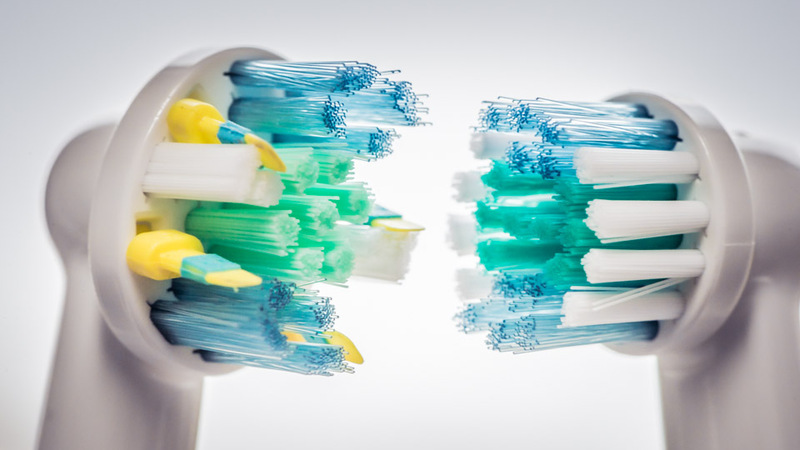 Outer and inner surfaces: Move the electric toothbrush along the gum line to clean the line between teeth and gums. This prevents the formation of gingivitis. Chewing surfaces: Brush each tooth carefully and tilt the brush slightly sideways to clean all deep lines. Inner surfaces of upper and lower front teeth: Turn the electric toothbrush almost vertically to prevent tartar from accumulating behind the lower front teeth. If your gums are damaged easily, start brushing from the most problematic area. Otherwise it is not important where you start brushing. The order of brushing can be, for example, as follows. Note the time on a clock when you practice brushing. If you brush your teeth too hard, most electric toothbrushes will notify you by stopping or using an indicating sound or light. The bristles of new brush heads also spread quickly if you apply too much force. If brushing your teeth too forcefully has become a habit, start brushing with the inner surfaces of your lower teeth. They are difficult to brush hard and thus, you will brush your teeth with the right pressure from the beginning. Replace your toothbrush or brush head every three months. Worn-out toothbrushes and brush heads do not remove bacterial coating (biofilm) effectively and may damage gums. Toothbrushes and brush heads should be replaced for hygienic reasons, as well, because they collect bacteria over time. 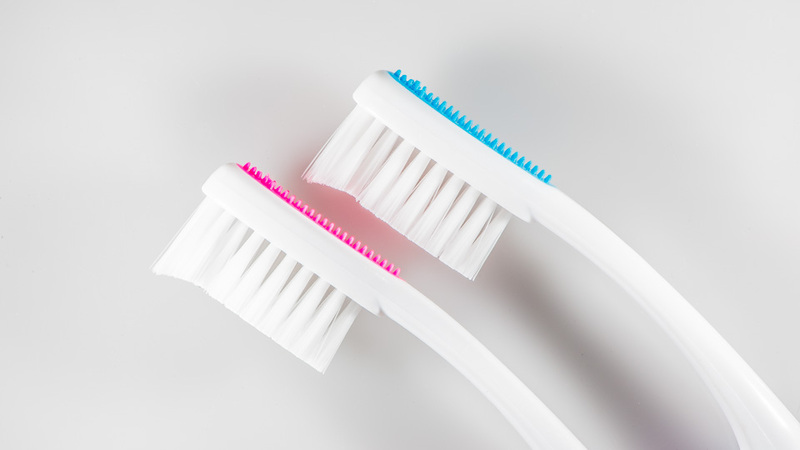 Toothbrushes and brush heads should not be shared with others, even temporarily, as bacteria and viruses can be transferred from one person to another through them. For example, parents can transfer Streptococcus mutans bacteria, which cause dental caries, to their children if they use the same toothbrush. There are different types of toothbrushes: battery-powered toothbrushes, rechargeable electric toothbrushes and manual toothbrushes. Brushes and brush heads are available for different age groups and for specific needs, such as for people undergoing orthodontic treatment, those suffering from wisdom teeth or rheumatic disease, those using dentures and for the disabled. An electric toothbrush is a rechargeable toothbrush with replaceable brush heads. Some electric toothbrushes use back-and-forth rotating and oscillating motion (3D cleaning technology) while others use ultrasound technology (sonic). The effectiveness of ultrasound technology is based on high-speed vibration and the process where fluid is driven between teeth. Battery-powered toothbrushes are more affordable than electric toothbrushes. They are used like manual toothbrushes, but the vibration of the brush head provides more effective cleaning. The brush heads of battery-powered toothbrushes are not replaceable. The bristles wear out with use and the entire brush has to be replaced every three months. Manual toothbrushes are not as effective as electric toothbrushes. However, they may have a better design when it comes to appearance or practicality. Manual toothbrushes offer more variety for different preferences and user groups than electric and battery-powered toothbrushes. Manual toothbrush bristles are available in different lengths and shapes. There are, for instance, cup shaped, crisscross, polished and rounded-end bristles. The handle is often ergonomically shaped and many brush models are equipped with a tongue cleaner. When used properly, all toothbrushes clean teeth well. The key is to choose a toothbrush that you are happy to use twice a day. Most people benefit from using an electric toothbrush. Electric toothbrushes have smaller brush heads which makes it easier to clean problem areas, such as molar teeth. Another advantage is their correct and fast bristle movement. Smaller brush heads are beneficial for people suffering from sensitive throat. Smaller brush heads do not irritate the throat as much as bigger manual brushes do. When used properly, both manual and electric toothbrushes clean teeth well. An electric toothbrush is particularly helpful for people who have trouble cleaning their teeth and are not able to use a manual toothbrush, often due to weakness in their hands as a result of a general disease (rheumatoid arthritis, muscular dystrophy, Parkinson’s disease) or a hand injury. Children’s fine motor skills are still developing, so they can get better brushing results by using an electric toothbrush. Children can start using an electric toothbrush at the age of 2-3. Many people alternate between using an electric and a manual toothbrush. As the brushing techniques of these two brushes differ considerably, it is recommended that children still learning to brush their teeth use either an electric or a manual toothbrush exclusively until they master the brushing technique appropriate for that particular type of toothbrush. When you are choosing a toothbrush, it is important to pay attention to the size and softness of the brush as well as the characteristics of the handle. A good toothbrush has soft and flexible bristles and a comfortable handle. A small brush head can access all parts of the mouth, including between the cheek and the upper back teeth. Toothbrush handles should be designed in a way that helps clean the mouth effectively. Manual toothbrush handles have to be flexible to prevent you from applying too much pressure while brushing, because excessive pressure can cause tooth and gum damage. Electric toothbrushes use a signal or stop to alert you when you are brushing too hard. Bristles can be classified as soft or medium. It is advisable to compare brushes as different brands classify softness differently. Sometimes brushing your teeth can be challenging due to orthodontic treatment, young age, general illness or disability. In such cases, dentists usually recommend using an electric toothbrush, although there are also specialized brushes available to help people achieve good cleaning results. A wide range of special toothbrushes can be found in pharmacies and well-equipped grocery stores. Your toothbrush should have soft bristles and be an appropriate size for your mouth. It is difficult to clean the back teeth with a brush that is too big, and bristles that are too hard can harm your gums and teeth. An electric toothbrush is powered by disposable or rechargeable batteries. Depending on the model, the bristles can produce up to 30,000 reciprocating, rotating or oscillating movements per minute. The effective brushing movements and small brush heads of an ordinary electric toothbrush can help you effectively clean problem areas such as molar teeth. A built-in timer, which ensures you brush for the recommended time. A wall-mounted display that shows brushing time. A pressure sensor, which prevents you from brushing too hard. Smart sensors that adjust brushing speed and movement depending on the position of the toothbrush. Different brushing programs to remove tooth discolorations and for sensitive teeth and gums. A smartphone application that can keep track of your daily routines, improve oral hygiene and make brushing your teeth more enjoyable. A sonic toothbrush is powered by disposable or rechargeable batteries. Its cleaning power is based on the extremely rapid vibrations of the brush head. It produces vibrations that are in the hearing range for humans (200-400 Hz) and makes 12,000-24,000 oscillations or 24,000-48,000 sweeping movements per minute. Sonic electric toothbrushes offer double-action cleaning power. Frequent oscillations of the brush head and the sweeping motion of the bristles clean teeth gently. In addition, the movement of the brush head drives a mixture of saliva, water and toothpaste between your teeth, cleaning them effectively. An ultrasonic toothbrush produces vibrations out of the human hearing range: 20,000 Hz-1.6 MHz. It can make up to 192 million movements per minute, breaking down bacteria on the tooth surface and slightly below the gum line. Separate settings for brushing tooth surfaces, gum line and molars. Different power levels to facilitate users ideal brushing experience. A pressure sensor that prevents users from brushing too hard. A built-in timer that helps users brush for the recommended length of time. Travel charger and toothbrush travel case. The additional features of ordinary, sonic and ultrasonic toothbrushes aim to ensure correct brushing techniques and brushing time. When you are choosing an electric toothbrush for yourself, it is worth considering which of the previously mentioned features you need. You can also try out a friend’s electric toothbrush (with your own brush head) or ask your dentist or dental hygienist for advice. In addition to choosing the correct electric toothbrush, it is important to choose brush heads carefully. Standard, soft brush heads are often the best choice for basic use. The bristles of electric toothbrush heads may differ in color or length. The ends of different types of bristles are cut differently to achieve the best possible results when cleaning the different tooth surfaces and the gum line. Fixed orthodontic appliances used for orthodontic treatment (i.e., braces) and tooth rotations and tilts can complicate brushing. Partly erupted teeth, such as wisdom teeth, can be difficult to brush. In such cases, a brush head with a special shape and smaller size can be used. A small, soft brush head (right) is recommended for basic use. Children’s electric toothbrush heads are smaller than adult versions. Special brush heads can be used to remove tooth discoloration. These models may have, for example, a rubber cup among the bristles. Brush heads equipped with rubber cups are not recommended for continuous use for people who suffer from erosion as the brush head may further damage already thin enamel. Brush heads designed for sensitive gums have a soft texture and are gentle on teeth. Soft brush heads can be softened more by holding the brush head under hot water. Curved brush heads have long bristles that surround the tooth and can reach the areas between teeth. Sonic toothbrushes also have brush heads with extra-long bristles able to reach between teeth. Although curved brush heads clean the areas between teeth more effectively than ordinary brush heads, they do not give the same results as using dental floss, a toothpick or an interdental brush. Electric toothbrush heads should be replaced every three months. Some models have reminder bristles that fade over time to indicate when the head should be replaced. Toothbrushes designed for children of different ages correspond to the sizes of their mouths and are smaller and narrower than brushes designed for adults. Children’s brushes are available in different colors and with pictures of cartoon characters. When you buy a toothbrush for your child, it is a good idea to let your child help choose one that he or she will be excited to use. Finger toothbrushes can be used to clean your baby’s gums even before the first teeth have erupted. A finger brush dipped in cold water can soothe itchy gums and help your baby get used to teeth brushing. You can brush your child’s teeth using a finger brush until he or she is used to brushing and you can switch to a regular toothbrush. Electric toothbrushes are suitable for children 2 years of age and older. Children’s electric toothbrushes are smaller than adult models and designed to fit a child’s hand and mouth. As a child’s mouth is small, brushing the teeth with a manual toothbrush can be difficult. The advantages of an electric toothbrush are their small brush heads and effective brushing motion, which help clean the child’s teeth. Toothbrushes designed for children are colorful and often have features designed to encourage teeth brushing—for example, music that plays during or after brushing. Children’s electric toothbrushes are designed for cleaning baby teeth and sensitive gums. The brush heads make 5,000-8,000 gentle back-and-forth movements per minute, removing bacteria effectively. Children’s toothbrush handles are ergonomically designed to be easily held by small hands even when wet. A child can start using an adult toothbrush at the age of 8-10 when most of the permanent teeth have erupted. The cleaning action of children’s sonic and ultrasonic toothbrushes is based on frequent vibrations of the brush, which clean the teeth and drive fluid between them. Children’s sonic toothbrushes can accomplish up to 31,000 movements per minute. Children’s brushes are smaller and gentler than the adult versions. Their brush handles are designed to fit smaller hands. Brush heads designed for children are smaller and softer than the heads for adults. Soft bristles are especially gentle on teeth and gums, and there are rubber-coated brush heads available for extra gentle and safe brushing. Many brush heads have elevated blue bristles designed to clean the chewing surfaces. The blue color fades with use to indicate when the head should be replaced. Electric toothbrush heads should be replaced every three months, or more often if necessary. Children’s sonic electric toothbrush heads are designed to clean growing teeth. Brush heads are available in two sizes: small and large. Toothbrushes designed to clean fixed orthodontic appliances (braces) are called orthodontic toothbrushes. They have shorter bristles in the middle and longer bristles at the edges. The shorter bristles have a V-shaped cut that facilitates cleaning around the metal brackets, metal wires and knobs of the orthodontic appliance. The longer bristles reach the gum line and around the appliances. The long and narrow neck of the brush facilitates reaching the back teeth. Interdental spaces and surfaces under archwires can be cleaned using dental floss designed for orthodontic appliances (such SuperFloss), a toothpick or an interdental brush. As orthodontic appliances cause toothbrushes to wear out more quickly, the brush should be replaced more often. Solo brushes have bristles only at the tip of the brush head and can be used to clean orthodontic appliances, crowns, bridges, implants, and back teeth. Solo brushes are also useful when teeth are crowded or slanted or when the back teeth, including wisdom teeth, are erupting. Dentists recommend using brushes with extra soft bristles (super soft) after oral surgical procedures. Soft toothbrushes are gentle on the tooth enamel and thus are also suitable for people suffering from erosion. Sulcus gum-line brushes can be used after surgery or if you suffer from gum disease. They consist of two rows of soft bristles. The narrow design allows for careful and gentle cleaning of the gum line. People with disabilities often find it difficult to brush their teeth due to lack of concentration or oral motor skills, a crowded mouth or a large tongue. Moreover, it can be difficult for a disabled person to understand the importance of brushing, or to keep the mouth open. People with disabilities are advised to use primarily electric toothbrushes. If using an electric toothbrush is not possible, a so-called triple level brush (e.g., a Super Brush) can be used. It cleans the inner, chewing and outer surfaces of teeth at the same time. Standard manual toothbrushes have additional attachments that can be installed in the handle to help you hold it firmly. A thicker toothbrush handle is necessary, for example, for people suffering from rheumatoid arthritis, muscular dystrophy, or Parkinson’s disease and for people who have lost their fine motor skills. Electric toothbrushes are recommended for people suffering from weakened hands. Toothbrushes with handles made of bamboo or biodegradable plastic are good options for nature lovers. Some models have replaceable brush heads that put less burden on the environment. Eco-friendly toothbrushes are sold both for children and adults. Handles made of bamboo are 100% biodegradable, while plastic handles are 95% biodegradable. Bamboo grows quickly without need for fertilizers or pesticides. Bamboo is naturally antibacterial and anti-slip, making it an ideal material for handles. Toothbrush handles made of bamboo are as durable as plastic handles. Eco-friendly toothbrush bristles may be natural bristles, often made of pig hairs. Bristles can be also made of BPA (Bisphenol-A) free plastic, such as nylon 6 plastic, which decomposes in 2-3 years without leaving toxins. Ecological aspects can also be taken into account when preparing toothbrush packaging. The packages may be made from corn starch or recyclable cardboard. Packages made from corn starch are compostable whereas cardboard packages can be recycled. Electric toothbrushes cost 10–250 dollars, depending on the added features. Brush heads cost 3–10 dollars each. Replacing the brush or brush heads add costs that are worth considering. For example, battery-powered electric toothbrushes are generally more affordable than rechargeable brushes. However, they do not usually have replaceable brush heads and the entire toothbrush has to be replaced every three months. Before your baby’s first teeth have erupted, you can massage the gums using a finger brush. A finger brush dipped in cold water can soothe itchy gums as your baby gets used to teeth brushing. As soon as the first tooth erupts, begin brushing with fluoride toothpaste twice a day. Using electric and manual toothbrushes requires advanced fine motor skills, visual perceptual skills and being systematic. Controlling the brush using a mirror needs practice. Parents are encouraged to help children brush their teeth until the age of 8–10. After your children finish brushing, check their teeth and brush them one more time. Depending on the age, children can brush their own teeth. It makes the experience more enjoyable for the child even if the adult has to later brush the teeth one more time. Ensure your child has the appropriate tools and environment for brushing. If the bathroom mirror is too high for your child, place a table mirror or a small stool in the bathroom. Remember to replace the toothbrush or brush head regularly. Doing other things (such as checking the phone or watching television) while brushing affects concentration and leads to poorer brushing results. Brushing your children’s teeth is easier if you make it an enjoyable routine for them. Be a good example for your child. Brush your teeth twice a day with fluoride toothpaste. Let your child choose toothpaste and a toothbrush for him- or herself. If your child is two to six years of age, hold him or her in your arms, almost in a lying position. Make sure the position is comfortable for the child and hold him or her still while you brush the teeth. Help your child rinse his or her mouth after eating to remove food particles. Encourage your child to open the mouth by telling stories about tooth trolls. Let your child practice brushing from the very beginning. Come up with a song and always sing it while brushing your child’s teeth. Let your child brush your teeth using your toothbrush. Listen to the funny sounds electric toothbrushes make. Praise your child even if you only managed to brushx one tooth. Reward good cooperation with small prizes, such as stickers. 3 to 6 years olds: Apply a small dab of toothpaste (about the size of your child’s pinky finger nail) twice a day. The toothpaste should contain 1,000-1,100 ppm fluoride. 6 years and older: Use a dab of toothpaste (5-20 millimeters) for adults containing 1,450 ppm fluoride. If you suspect that the well water you use has too much fluoride, you can have it examined. Based on the results, you and your dentist or dental hygienist can figure out the appropriate fluoride dosage. For more information on well water examination you can search EPA Reviews and Water Systems Council’s website. There are good and bad days when it comes to brushing your child’s teeth. 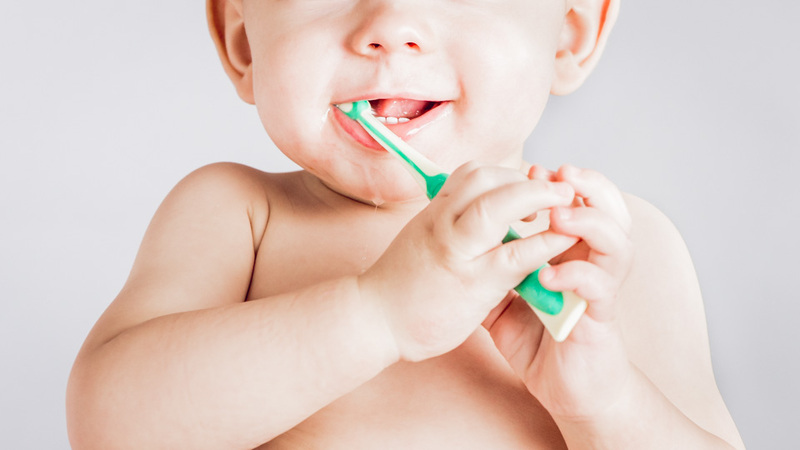 Teething and the “terrible twos” can complicate brushing. It is important not to give up, as children’s teeth are at higher risk of tooth decay without adult help. Brushing can become an enjoyable daily routine through play. A child is brushing too hard if the bristles of a new brush or brush head spread quickly. To avoid this, it is a good idea to start brushing from a problematic area such as the inner surfaces of lower teeth, which are difficult to brush with a lot of force. Some areas may not be clean despite careful brushing. Plaque discoloring tablets turn bacterial coating red, allowing you to see how well you brush your teeth and which areas you should clean more carefully. Plaque discoloring tablets are sold in pharmacies. You can also ask your dentist or dental hygienist for advice about cleaning your child’s teeth. Children may need extra support with brushing when their baby teeth start to fall out. When a child is about six years old, the first permanent molars (also called six-year molars) erupt behind the temporary molars. As the permanent molars decay very easily, it is important to notice when they erupt and start brushing them as soon as possible. The front teeth often fall out at the same time as the first permanent molars erupt. Thus, children may suffer from gingivitis due to gaps between teeth as well as moving and erupting teeth. Bartlett DW et al. A critical review of non-carious cervical (wear) lesions and the role of abfraction, erosion, and abrasion. J Dent Res 2006;85:306-312. Grender J, Williams K, Walters P et al. Plaque removal efficacy of oscillating-rotating power toothbrushes: review of six comparative clinical trials. Am J Dent 2013;26:68-74. Hausen, H., Pöllänen, M., Alaluusua, S., et al. 2014. Karies (hallinta). Käypä hoito – suositus. Heikka, H., Hiiri, A., Honkala, S. et al (toim.) Terve suu. Kustannus Oy Duodecim 2009. Robinson P, Deacon SA, Deery C et al. Manual versus powered toothbrushing for oral health. Cochrane Database Syst Rev 2005:CD002281. Sicilia A, Arregui I, Gallego M et al. A systematic review of powered vs manual toothbrushes in periodontal cause-related therapy. J Clin Periodontol 2002;29:39-54. Slot DE, Wiggelinkhuizen L, Rosema NA et al. The efficacy of manual toothbrushes following a brushing exercise: a systematic review. Int J Dent Hyg 2012;10:187-197.